Let me confess that I love and collect tools. I’ve had a relationship with tools since I was a child. It probably stems from my father being an avid do it yourselfer. I can remember dozens of projects that I helped my father with. Working on cars, plumbing repairs, concrete work, seemingly there was nothing that we wouldn’t tackle and take on at least once. So naturally, as with all things, I’ve carried the Do It Yourself flag to a new extreme in our family History! I’ve torn out bathrooms and kitchens and replaced them top to bottom. I went nuts (so my wife would say) in our yard and dug in a pond with a running stream and a waterfall. The list is pretty extensive. But one key factor in being a dedicated DIY nut is that you need the TOOLS to do your projects right! That is my self justification for wanting tools, please don’t try to convince me that it’s misplaced or self-serving. My wife has tried and hasn’t succeeded. That’s my excuse and I’m sticking to it! Actually, saving money through DIY is a driver in why I do many projects myself. Having the right tools to do them correctly is equally important. Renting the tool is certainly an option but if you know that you’ll be doing projects in the future that the tool would make easier to complete, then in my mind, it makes sense to buy it. Some tools are really mandatory to rent, when I needed a small excavator for the pond project, I rented one. I can’t begin to imagine what life would have been like for me at home if I had bought an excavator home, “Hey Honey, Check out what I just bought…”, may have been my last words. Over time is the best answer I can give you. I’ll pick up a few few tools here and there as I need them, or as old tools wear out. I’ll usually only do this if they are on sale or I can get a good coupon to save on them. With some tools I’ll go second hand and usually find one on Craigslist for a lot less than buying a new one, even with a discount. A new project is usually another “event” that will lead to the acquisition of a new tool or two. Is it economically justifiable? I believe so, especially when it involves a project. As a result, every time I take on a project I add a few more tools to my collection. This leads me to my second confession. I have a two car garage loaded with tools. Woodworking, welding, electronics, automotive tools, my garage is absolutely loaded with tools. Can I get a car in there? Are you kidding? Garages aren’t made for cars, they’re made for tools! 🙂 . In case you’re wondering, I’m not a complete tool nut. I will periodically take a hard look at my tools and sell some; I recently sold the tile saw (after using it for a few more tile projects) and got back a bit less than what I paid for it. 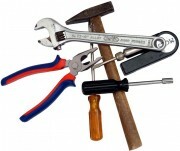 So why is an article on tools in a personal finance blog? Because they cost money and can be major temptation in impulse buying. Lately I’ve been pretty good about warding off impulse buys on tools. The last one one was for a rechargeable 18v drill. My set of Ryobis’ are getting old and the batteries are getting to the point where they will have to be replaced soon. I started looking around and found that the Rigid brand of 18v tools offered a lifetime service agreement, and that covered the batteries as well! replacement Lithium Ion batteries run from $75 to $125, so having a lifetime service agreement on the batteries is a pretty good deal. The thought of getting a new set of 18v drill with Lithium Ion batteries that had a lifetime replacement service agreement for about $200 was tempting beyond description. I had one small problem though, I had other 18v tools that used the Ryobi batteries. I really don’t want two different types of batteries to have to worry about and besides, the original potential problem of having to replace the batteries soon wouldn’t be resolved. So I did what any tool junkie would do. I looked at the complete set of Home Depot 18V tools. So now I was looking at a $600 expenditure instead of $200. No problem, I just printed up a competitor’s 20% off coupon and that would knock $120 off the new tools. Do I Buy those Tools or Not? I printed that coupon and put it on my desk. One thing I’ve forced myself to do with any major purchase is to sit on it for a few days. While a few days passed I asked myself a few questions. Did I really need that set or just want it? How bad were my old batteries, were they going to give out tomorrow or would they potentially last more than I expected? The shopper in me wasn’t too happy with the answers I was giving myself. I didn’t really need to buy them. The ones I have are adequate to the tasks I demand of them and they’ll probably last for a bit longer. Ultimately, I didn’t NEED these tools, I WANTED them. Eventually, I threw the coupon away and pushed the ever tempting though out of my mind . I consider that a major success in my battle against “Impulse buying”. You may be wondering if I’ll actually ever buy those 18V, bright and shiny tools from Home Depot. The answer is that yes, ultimately I will. But it will be when I have absolutely worn the Ryobi set past the point of no return, when Home Depot has dropped the price to somewhere near a reasonable level and when there’s an aggressive coupon, either from the HD or a competitor available. I’d be interested in hearing from those in the personal finance community what your buying or collecting weaknesses are. Obviously tools are one of my key temptations. Do you have hobbies that are inherently expensive or require expensive gear? How do you fund them and more importantly, have you found ways to save on what it would normally cost you to participate in those hobbies? I definitely see the value in buying tools – as long as it’s not an impulse buy! If you are a do it yourselfer you are saving major bucks down the long road and those tools are a good investment. That’s what I keep telling myself! The impulse buy is the biggest challenge, but thankfully, I’ve been able to keep that under control. If you’re going to use them time and time again then I think a good set of tools can be a good investment. The problem with my tool shed is that I constantly seem to spot tools that I bought for a job and have never used again! Great post Jose. Ummm, I think I’ve run into that as well. When I run into tools that aren’t really going to be used anymore I’ll put them on Craigslist. They usually go fairly quickly. Thanks for the kind words! I love some tools as well Jose. My hobby is fixing up old Jeeps. It is not a cheap hobby by any means. I get tools when I need them and rarely rent them unless it is a very expensive tool. I find use for all of my tools beyond my current project, so I think they are worth the investment. I’m with you, I will occasionally rent an obscure tool that is specific for one job only. I recently did the plugs on my F150 and as expected, one of the plugs broke off. I rented that very specialized plug removal tool (it worked as advertised!) as I couldn’t justify spending $120 on a tool that I would probably use only once. Actually, it wasn’t even a rental, the local parts store’s tool loaner program charges you for the tool then gives you a full refund when you return it. So it worked out well for me! Perfect timing. I’ve been dumping so much money on tools and home improvement supplies. But looking at what it’d cost to pay a pro to do some of this stuff, I feel like I’m saving money. I bought a King Canada miter saw for $80 the other day because I’m adding balusters to a balustrade to bring it up to code (every 4 inches) and figured a miter saw is a good tool to have around anyway. A compound miter saw is a “Class A” tool, meaning that I will always have one in my inventory. I have an old DeWalt 12″ and I have gotten my money’s worth several times over on it. Good luck on the baluster’s and let me know if you ever get the urge to do any crown molding. I picked up on a good trick on how to do Crown molding without getting into complex angles!